One of the most important interactions in the world of social media is the concept of “Like”. Shortly after its invention it was adapted by nearly all social networks and is now one of the most important features of every one of them. This concept is now nearly a decade old and it is maybe about time that we come up a with a new idea to replace the “Like” button with. The problem with the current way of liking a post is that you only have two options. Either you like a post or you do not. There is no way to show how much you like something without actually writing a comment. This definitely takes some time and you probably just hit the “like” button and move on. With this approach, the possible constructive dialogue that could have been started between you and your friend about something each of you have posted is just lost in between your “like”s. When we like something we normally cheer and clap. The exact same approach has been developed for Vidonado. Vidonado is a video social network where you can create and share videos based on video ideas others have created or create video ideas yourself. 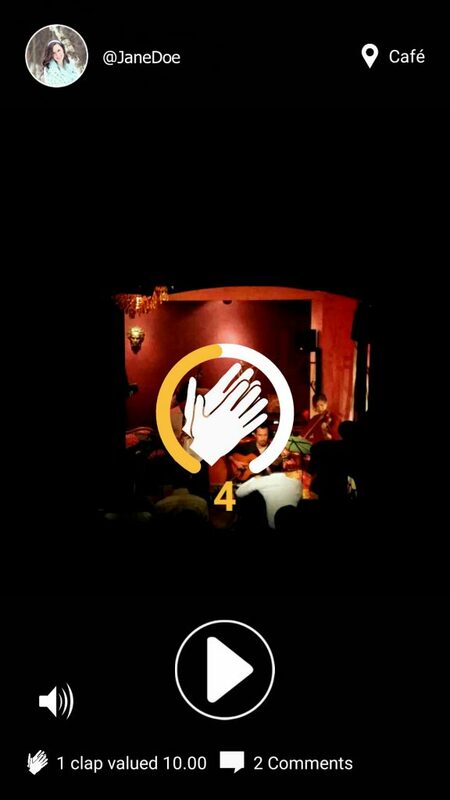 In order to clap for a posted video, you can double tap the screen and hold the second time you touch the screen. Keep your finger on the screen until the “clap” sign reaches the amount you like. You can clap 10 times maximum. In order to speed up the whole process, you can also just double tap in order to clap 10 times. Your clap will be added to the list of claps users have submitted. Now, every video will have a number of users who have clapped for a video and an average of all the claps it has received. The above concept, will give a new meaning to the concept of “like” in the world of social media. Now, when a friend of yours claps 5 times, you will have a reason to talk to them the next time you meet. This will make your online interactions more innovative and fun.